These parts are for all recent model Bestest horizontal indicators ending in -3 or -5. The only difference between the two is the color of the dials, spacing ring and the hand. Parts for the older models ending in -1 or -2 will be difficult to find. Tesatast indicators use the same parts with the exception of the dial. Spare parts for vertical models are shown on page 225. 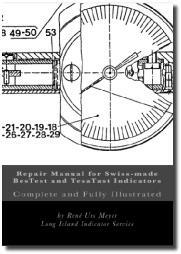 Repairs: if you'd rather have us take a look at your indicators please see page 30. New BesTest dials (since 2016) are made of plastic and no longer have the model number printed on them. Instead, all new indicators have the number etched on the body cover plate. If you need to replace the old dial, be sure to scratch the model number on the body somewhere, so that you will know which model you have. Otherwise, it could be difficult for you to order correct parts in the future. As of 2018, BesTest indicators are being assembled in China, using Swiss made parts, we are assured. Spare parts are interchangeable between BesTest indicators assembled in Switzerland and those assembled in China. The older, Swiss made models will have the words "Swiss Made" printed on the dial. B&S numbers apply to the BesTest brand of indicators sold in the USA. The identical models are sold world-wide using the Tesatast name and TESA numbers. This page is for reference only. Spare parts are no longer available from us with the exception of Bestest contact points. gear rack .0005” and .001"
complete movement .001" and .0005"
complete movement .0001" and .00005"
* new dials are plastic and do not have model numbers printed on them. If you are replacing the dial on an older indicator, be sure to mark the model number on the body, just below the engraved serial number. This will make it easier to reorder spare parts in the future. New dials are plastic and do not have model numbers printed on them. If you are replacing the dial on an older indicator, be sure to mark the model number on the body, just below the engraved serial number. This will make it easier to reorder spare parts in the future. The damaged crystals are removed with a special tool which acts like a suction cup. You can improvise other methods but you're likely to cause damage. Often times the new crystal, which is slightly convex, can be snapped in by hand, but even here, we use special equipment to avoid damage to the indicator. It's best to leave this to someone with the right tools. 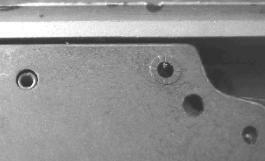 Caution: Unlike many other test indicators, the bezel can not be removed without complete disassembly. Movement disc (023042) is not suitable for parallel model 7021. The orange hands are ridiculously expensive to buy so here is a word of warning: just about any cleaning product will wash away the orange paint, so don't try to clean them. Painting the hand with fluorescent red or orange enamel will work, but acrylic paints are not very good for this job. The "complete movement" is inside the body, held in place by two flat head screws. If the crown gear is damaged, jewel is cracked, or the whole movement is hopelessly cruddy, this may be a quick, although costly, fix. Also, if the accuracy is off by just a bit and you are convinced that you have the correct contact point and the correct pivot installed, then replacing the movement may solve the problem. It is possible to convert your inch model to a metric model (or vice versa). Those with graduations of .001" or .0005" can be converted to 0,01 mm. Those with .0001" or .00005" can be converted to 0,002 mm. This will require replacing the dial and the pivot. Complete disassembly is required. 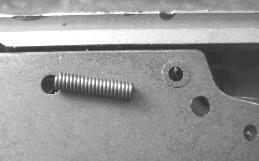 Do not forget the anti-shock spring (023413). It prevents over-travel and should always be installed. Nothing holds it in place. It will fall out on its own if you open the cover or start to clean the movement. The spring simply drops into the opening as shown in these photos. Complete repair instructions are available. Click here for details. Would you like us to do the repair? Take a look at page 30. Complete and fully illustrated. Contains detailed photographs of every step required to disassemble, clean, and reassemble these indicators. Step-by-step instructions on replacing and repairing damaged parts. Illustrated parts lists, parts breakdowns, exploded view drawings. Calibration trouble shooting. Repair tools and techniques. Based on over 35 years of personal experience. Available from online booksellers worldwide. Click for details.